South Carolina is one of several familiar faces Marquette could encounter during the National Invitation Tournament. Barring an abrupt forfeiture of logic by the NCAA Selection Committee, Marquette (19-13) will be headed to the National Invitation Tournament. It’s a disappointing end to the season for Golden Eagle fans, who were expecting another trip to March Madness. The NIT isn’t nearly as exciting as the main tournament is; the teams aren’t as good, and there’s no national championship at the end of the rainbow to case. Fans who don’t want to watch the NIT, even if their favorite team is in it, could hardly be blamed for thinking that way. That said, there are some interesting match ups the Golden Eagles could potentially run into at various points in the tournament. A few likely NIT teams have long-standing histories with Marquette as a program or some of the team’s current players. Any of these games might be worth a watch if they come up. UNC ASHEVILLE: It’s the Andrew Rowsey bowl! The Golden Eagles’ lone senior played in Asheville during the 2014 and 2015 seasons before transferring to Marquette. While most of the guys that shared the court with Rowsey have graduated, two current Asheville seniors — Kevin Vannatta and Alec Wnuk — were freshmen during his final season. Asheville was a No. 1 seed in the Big South Conference Tournament but was defeated by Liberty in the semifinals. It’s likely that the Bulldogs will get either a No. 7 or No. 8 seed in NIT, which means Marquette could play them in its opening game. SOUTH CAROLINA: Last year’s Gamecocks beat Marquette in the opening round of the NCAA Tournament, 93-73, to begin a run that would end in the team’s first Final Four appearance in school history. A potential rematch would obviously carry far lower stakes, though there’d be some symmetry in hosting South Carolina after last year’s game was played 40 minutes from their campus. Sindarius Thornwell, the top scorer, rebounder and passer from the 2016-’17 Gamecocks, went to the NBA at the end of the season. Several familiar faces remain, though, including power forward Chris Silva, who scored 10 points in South Carolina’s victory. NOTRE DAME: Excluding Wisconsin, the Fighting Irish might be Marquette’s greatest historical rival — not that current Marquette fans would know it by looking at the schedule. 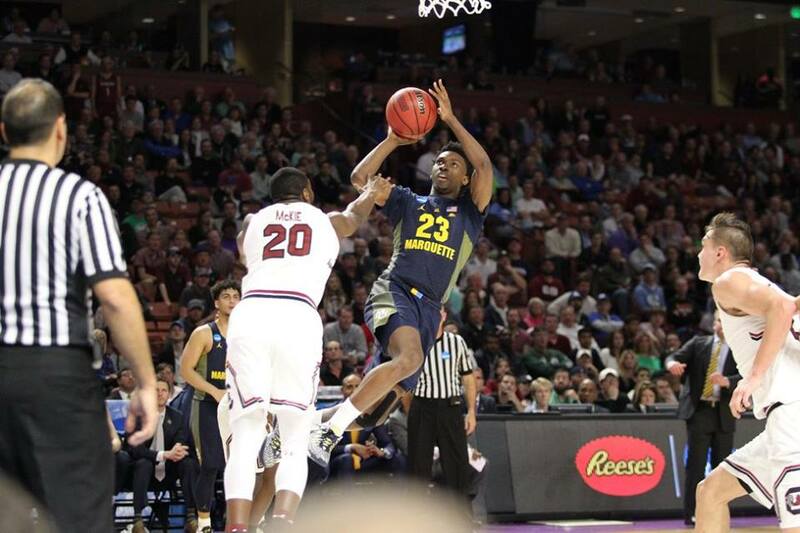 The most recent of the 116 meetings between Marquette and Notre Dame was in 2013 when Jamil Wilson scored 19 points to knock the Irish off on National Marquette Day. Only DePaul and Wisconsin have been more frequent opponents over the years. This year’s Notre Dame team was projected to be a national title contender, but top players Bonzie Colson and Matt Farrell were both hurt for a significant portion of ACC play. The Irish were 1-4 in games that both players missed and suffered nine of their 14 losses with Colson off the court. Now that both players are back, the Irish are more likely to resemble the team everyone thought they’d be. SYRACUSE: This would be another showdown of former BIG EAST teams. Syracuse was a member of the old conference from 1979 to 2013 then bolted to the ACC because of football revenues. The Orange have made the NCAA Tournament in 31 of the past 40 seasons, with two of the nine misses occurring since switching conferences four years ago. Marquette fans have mixed memories of Syracuse. An unlikely run to the Sweet 16 in 2011 was made possible by Darius Johnson-Odom’s late 3-pointer to upset the No. 3-seeded Orange. Syracuse returned the favor two years later, smothering Marquette’s offense in a 55-39 victory to reach the Elite Eight. The Golden Eagles shot an anemic 22.6 percent from the field in that game, a single-game low that Wojo’s teams have yet to even approach. ARIZONA STATE: Of all the teams in the NIT, Arizona State is the one that is most similar to Marquette. Like Marquette, Arizona State has a top 20 offensive efficiency rating in KenPom and one of the most porous defenses in high-major college basketball. High-powered offenses aren’t the only way in which Marquette and ASU are alike. Bobby Hurley, a former Duke University guard and teammate of Wojo’s, coaches the Sun Devils. The two teams played a home-and-home series in the 2013-’14 and 2014-’15 seasons, with each school winning on its own turf. Marquette won the de facto tiebreaker in 2015-’16, beating the Sun Devils in the final game of the Legends Classic in New York City.